Hawaii Massage Clinic is located in the heart of Waikiki (Honolulu, Hawaii). We provide you with LomiLomi massage, a traditional Hawaiian massage. Why our price is so reasonable? Aloha! 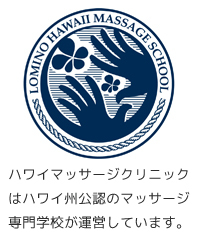 We teach and train massage students by following the curriculum approved by the state of Hawaii. Along with the skills taught, I also promote the “Aloha Spirit”, which involves deep care during the services as well as a sincere and friendly work attitude. Our staff is here to support your stay in Hawaii by providing you with the highest quality Lomi Lomi massage. We assure you that our massage will help eliminate the exhaustion of traveling and make your stay in Hawaii more enjoyable. Aloha! Welcome to Hawaii Massage Clinic! This is a homepage of Hawaii Massage Clinic. This clinic is run by a massage school that is approved by the State of Hawaii. You can have good quality massages with the most reasonable prices. We would be most satisfied if our massage services can help your stay in Hawaii be a more pleasant one. Why choose Hawaii Massage Clinic? Very convenient! We are located in the heart of Waikiki!